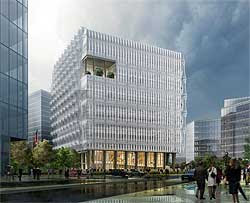 The winning design for the new US Embassy has been announced. They'll be moving from their current position, in posh Mayfair, to a spanking new building on the south bank by Vauxhall, at Nine Elms, due for completion in 2017. The Philadelphia-based practice KieranTimberlake won the bid. They've taken time out from making shoes and pop singles to come up with this bold vision (right). Perhaps it was inspired by 'local traditions', such as the 3-D headache of the Michael Faraday Memorial at the Elephant and Castle. And a real, genuine bit of America-in-Britain the new Embassy is. Because despite all the mentions of the 'environmental responsibility', 'sustainable design' etc, guess how much mention there is of bikes? Yup: sod all. Nothing about parking or access. Oh well: the terrorists will just have to drive there, like everyone else. Mind you, given that Nine Elms Lane has one of the Britain's worst bike lanes, that's hardly surprising. 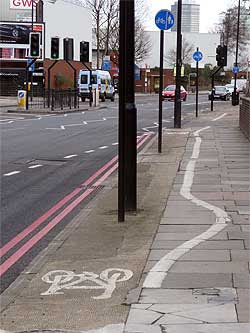 Who'd want to cycle there anyway? This is one of my favourite stretches of it, not far out of Battersea. In the space of fifty or so metres, the lane is blocked at least five times by posts in the middle of it (right) - two of them for signs informing you that it's a bike lane. You sure that's not the new Battersea Dogs Home? At least, cycling seems to be in the dog house here. I look forward to all your photos of cars with diplomatic plates parked across local cycle lanes and on the frabjous cycle superhighway. "The embassy now owes a backlog of charges and fines worth £3,446,420." Philip - Bow wow wow. Drip drip drip - one day Lambeth will notice Rob's banging on about Nine Elms Lane and fix it. Maybe. • The design places the embassy building at the center of the Nine Elms site and develops the surrounding area into an urban park. • There are two major east-west pedestrian and vehicular paths, one existing and one to be improved, and the other proposed as part of the enabling infrastructure for the Nine Elms development. The existing infrastructure is along the south Thames embankment and is composed of a river walk paralleled by Nine Elms Lane. The proposed new infrastructure to the south of the embassy site is a pedestrian greenway that will connect the embassy site to Vauxhall Station, the nearest tube stop to the east, and on to the proposed new Battersea developments to the west. Poised strategically midway between these parallel paths, the embassy becomes part of an urban park that connects the Thames embankment to the new pedestrian way to the south. • The paving about and within the embassy site utilizes the familiar limestone used in many London walks and parks. London Plane trees provide shade and form at the perimeter and along Nine Elms Lane as well as the proposed new walk to the south that connects the site to Vauxhall Station. • Seen from the north along the Thames embankment and Nine Elms Lane, the new Embassy Park contains a pond with walks, places to sit and landscape along its edges, all open to the citizens of London. Oddly the architects forgot to draw the concrete barriers, bollards, minefields, squads of marines, laser-death missiles, and moat of doom that will undoubtedly surround any future US embassy. Let's hope the evildoers don't figure out how the build the BikeBomb which could slip through their defences and jump red lights, all at the same time as terrorizing Daily Mail readers. Fortunately I have about as much interest in visiting the US embassy as I do in visiting the US! "Oddly the architects forgot to draw the concrete barriers, bollards..."
The original design brief called for a 100m exclusion zone around the building - this is what all those raised concrete plates with gardens and water are for. So all that stuff you list IS there, you just can't distinguish it from everything else. Who needs bollards when there is a moat built-in?